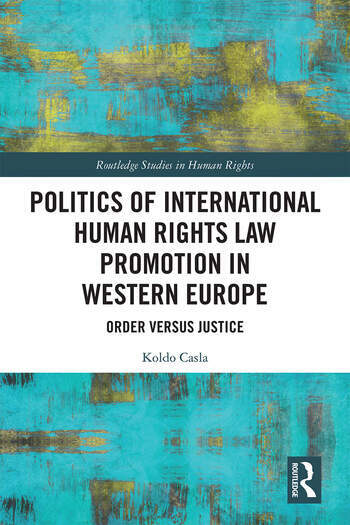 This book offers a critical reinterpretation of Western European States’ programmatic support for International Human Rights Law (IHRL) since the 1970s. It examines the systemic or structural constraints inherent to the international legal system and argues that order trumps justice in Western Europe’s promotion of international human rights norms. The book shows that IHRL evolved as a result of a tension between two forces: a European understanding of international society, based on order, the centrality of the State and a minimalist conception of human rights; and a civil society and UN-promoted, mostly Western, particularly European but broader conception of human rights, based on justice. As such, human rights norms emerge and develop when (some) States’ idea of order meets with advocates’ idea of justice. We are living a historical juncture of shifting tectonic plates with rising nationalism in the Global North, ever growing power in the Global South and a declining presence of Europe in global affairs. The conditions under which IHRL emerged have fundamentally changed and unpacking the factors beneath the international recognition of human rights has never been more pressing. This book will be of key interest to scholars, students and practitioners in human rights law, public international law, international relations, critical legal theory and more broadly to European politics. 1. Introduction: Why Do Western European States Promote International Human Rights Norms? Koldo Casla is Research Associate at the Institute of Health and Society, Newcastle University, UK.